Committee helps organize special CHANCE issue, The Role of Statistics in Climate Research, December 2017. Committee writes letter with ASA President to National Center for Atmospheric Research expressing deep concern for the elimination of its Institute for Mathematics Applied to the Geosciences, 10/23/17. Committee organizes session for ISI's 61st World Statistics Conference, “Statistical Developments in Climate Science Research”, July 19, 2017. Committee organizes 2017 JSM session, Climate Change, Extremes, and Impacts. Joint TIES/ASA ACCCP session, Statistical Developments in Climate Science Research, accepted for 61st World Statistics Congress - ISI 2017. ASA and Royal Statistical Society send letter to Australian Government about cuts to climate research at CSIRO. ASA Joins 30 Societies on Letter to Congress with Consensus Scientific View of Climate Change. ASA signs onto letter to House leadership discouraging provisions that might limit federal government's access to the best available climate science, 4/24/15. 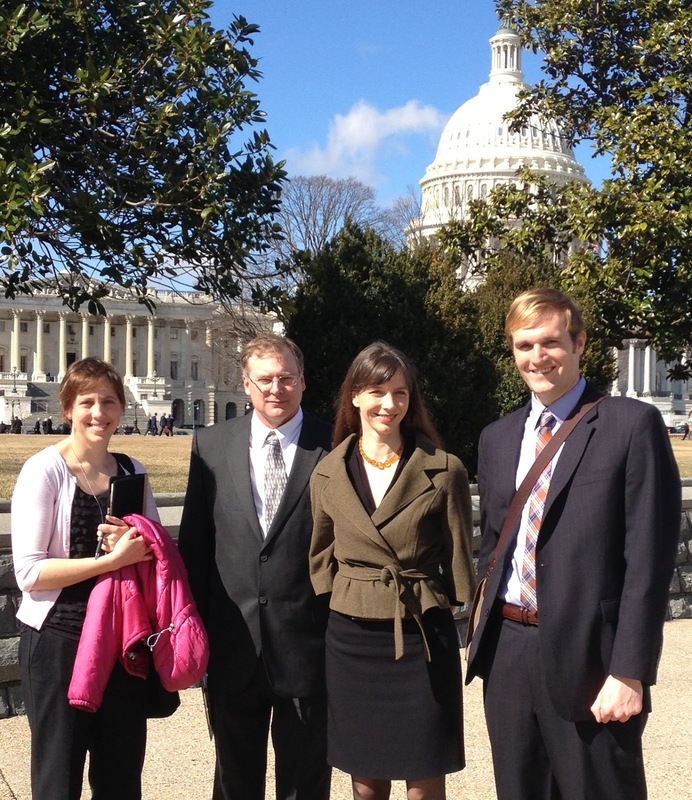 ASA Participates in 6th Annual Climate Science Day on Capitol Hill, February 10, 2016. Informing ASA position on letter to Congress regarding access to best available climate science, 4/24/15. Statistical Science: Contributions to the Administration's Research Priority on Climate Change, ASA White Paper, April 2014. Climate Science Day on Capitol Hill, February 27, 2013: Photo of Richard Smith with Senator Hagan (NC); Robert Lund with his CSD team; AAAS story on CSD13; Climate Science Day Successful, Educational. JSM 2011 Invited Session: "Addressing the Evidence for Anthropogenic Climate Change"
Climate Science Day on Capitol Hill, February 17, 2011: "Statisticians Participate in Climate Science Day on Capitol Hill"
The group has been meeting with congressional staffers to discuss the contribution statistics can make and to learn more of their needs and developing materials for the staff. Committee members publish a piece in March 2010 AMSTAT News: "Statisticians Comment on Status of Climate Change Science". On March 31, the authors also participated in an online q&a on the article: http://magazine.amstat.org/2010/03/climatemar10/2/#transcript. The group helped review the October 21, 2009 joint science organization letter on climate change science and provided advice to ASA President Sally C Morton on signing it. Contact: Steve Pierson, ASA Director of Science Policy, pierson@amstat.org; 703.302.1841.